The ongoing crisis triggered by the subprime mortgage defaults continues to spiral into new directions, making it difficult for even experienced market watchers to comprehend the complete picture and its implication for the financial markets. Therefore this article attempts to explain the crisis and what it implies for future interest rate trends. These are Mortgages made available to those of subprime credit risk (poor credit histories), hence called sub prime mortgages. Why would financial institutions lend to people with poor credit histories ? The lending occurred during the property boom, the longer it went on the more lax the rules for lending become, as has happened during past property booms. Property seemed like a one way bet and therefore lenders could charge poor credit risk customers more interest and fees in securing the mortgages. Whereas if the borrower failed to pay the loan then the lender could foreclose and sell the property at a profit and thus there was little perceived risk in the market place. Where did the money come from ? 1. Low Interest rates - The world was and still is to some extent awash with cheap money due to historically low interest rates, this enabled lenders to borrow at low interest rates and loan out at much higher interest rates. 2. Fractional Reserve Banking and the Money Supply - Basically, the governments of the world borrowed from their central banks, especially in the US. This is in fact printing money. The commercial banks were able through the fractional reserve banking system lend out many times the amount they had on deposit with the central banks, and thus creating money from X10 to X20 the original amount borrowed by governments. This flowed into many assets including loaned out to those of a sub prime risk. 3. The Yen Carry Trade - This is an example of a Japanese government printing money to keep their currency artificially low so as to enable Japan to export goods to mainly the US through the use of very low interest rates. This enabled both financial institutions to borrow in Yen at low interest rates of say 1% and lend to those of a sub prime risk and charge them say 5%, and for Japanese investors to invest their capital abroad. When did things start to go wrong ? The US housing market was roaring ahead and as with any bubble, most participants tended to get carried away with themselves in terms of debt taken on and expectations of future growth. During the last 2 years of the boom 2005 and 2006, lenders were falling over themselves to lend money to even poorer risk borrowers so as to benefit from the extra return. However the sub-prime borrowers were saddling themselves with debt that even at low interest rates they would have some difficulty in servicing. However, things started to fall apart when interest rates across the world started to rise. Why did world interest rates rise ? Eventually the excessive growth in money supply over the last 3 years, which had chased most assets higher, was flowing into commodities that fed the chinease production machine started to take off and sky rocket to new highs as both production and speculative demand had soaked up the stockpiles and there had been relatively little investment in mining capacity during the preceding 20 year commodities bear market. Even gold came alive, threatening to march to a new high . This resulted with the coming to an end of the deflationary effect of cheap chinease goods due inflationary pressures within China. This is an ongoing process that will continue for years to come and have an upward push on world inflation compared to the previously deflationary effect. The credit crunch started to occur when people with poor credit were in, increasingly numbers unable to meet the higher debt repayments due to rising interest rates and were being foreclosed. As foreclosures escalated the housing bubble burst in the USA. This started in early 2006 and continued to worsen throughout 2006 and into 2007. What happened was basically institutions that borrowed in Yen at less than 1% and invested elsewhere for much higher returns, such as in the subprime mortgage sector. This is further exacerbated as through the use of on leveredged derivatives products. The whole system is reliant on Japanese interest rates remaining low and the Yen weak. If the yen strengthens then the value of the debts increases and thus a rush for the exit as people look to liquidate positions further strengthening the yen and carry trade losses. This is what happened when China wobbled during Feb 07. There was a dash to liquidate Yen Carry trade positions i.e. reduction in global liquidity, out flows from stock markets and a squeeze on mortgage lending in the subprime mortgage sector. However the subprime mortgage market was already in meltdown as the losses were being realized through foreclosure. This was expected to have an knock on effect on economic activity which increased the chances of a US interest rate cut, which ironically meant an even greater loss of liquidity due to greater risk of future failures. However this warning at the time proved temporary in most cases apart from the Sub Prime Mortgages which continued to deteriorate whilst the Stock markets recovered. Why Hedge Funds are Failing ? Hedge funds, deploy leverage to enhance their exposure to markets, When things are moving in the right direction this results in phenomenal profits. However as is eventually the case, the 'bets' get bigger and bigger and its only a matter of time before the 'gamblers' find themselves on the wrong side of the market. This is what happened with Two of Bear Stearns Hedge funds, which placed highly leveraged bets on packages of subprime mortgage derivative products. When the value and credit worthiness of these bond packages called collateralized debt obligation (CDO') was cut due to the subprime defaults. The effect of this was to virtually wipe out the total value of the funds that had previously been rated as low risk. The problem here is that they should NOT have been rated as low risk. The CDO packaging enabled institutions to mix good risk and bad risk debt all in one pot and label it as good risk. Therefore the financial institutions earned a higher rate of return on what seemed like a relatively low risk CDO package. that was priced in the market price as low risk debt upon which hedge funds such as Bear Stearns leveredged to the hilt. And here were talking about the Subprime Experts getting wiped out ! The Impact of Hedge Fund Losses ? The Hedge fund failures has two key effects. 1. A Financial Shock to the System - Results in a re-rating of risk across the board, as financial institutions during the boom period have loaded themselves up with similar CDO packages, which are now expected to be worth much less than previously thought. As the market is pricing them at a much higher level of risk. 2. Derivatives Ripple Effect - Bear Stearns weren't the only people betting on the subprime mortgage market using highly leveredged derivatives. Many 'less experienced' hedge fund gamblers and other financial institutions also have exposure, and we can expect many more failures in the market place as people try to rush for the exit to cut exposure. It is unknown how much damage will be done. But the mark down of the financial sector in advance of bad debt provisions is a clue that were talking about in the hundreds of billions of dollars and there in lies the credit squeeze. Effects of the Credit Squeeze. As financial institutions are forced to 'cover their bets' by making provisions for bad debts, and losing their high interest rate / 'low' risk subprime cash cows. They are in effect withdrawing liquidity from the market place and making it more difficult for borrowers across the board of all shapes and sizes to borrow money for whatever economic activity. This means that this will impact on the economy and thus depress the US housing market further which results in more foreclosures and more squeezing of credit to cater for this. Conclusion - What Will the Central Banks Do ? The conclusion to be drawn is that as economic growth slows under the weight of the ongoing liquidity crunch brought about by the subprime mortgage losses rippling out to other sectors of the economy. Many of the worlds central banks will have to cut interest rates in an attempt to counter the liquidity squeeze. Therefore it is highly likely we are very near an interest rate peak of some significance. 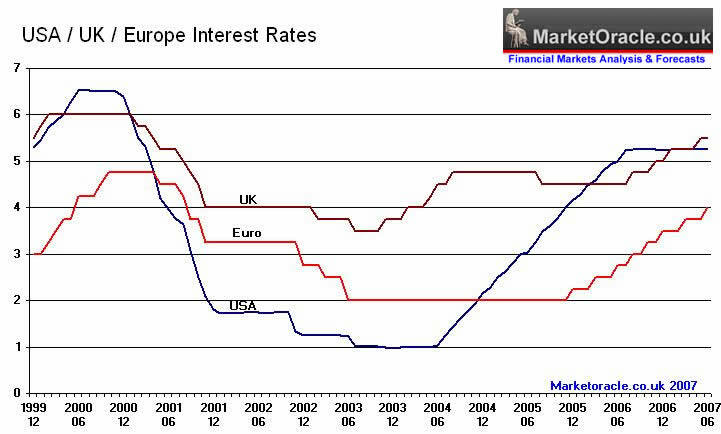 I expect the USA to be the first to cut interest rates, followed by the UK and then the European Central Bank. This is pretty much contrary to current market consensus and therefore an opportunity exists for those of a similar opinion to make decisions ahead of the curve as the market realise's the bullish implications of much lower interest rates. 31 Jul 07, 01:39 Other hedge funds ? what about the other hedge funds which invested in subprimes? We are only hearing about bear stearns's hedge funds. 31 Jul 07, 23:20 "I expect the USA to be the first to cut interest rates"
"I expect the USA to be the first to cut interest rates", could this cause dollar down and Yen up. Then this will trigger carry trade rewinding so that would further squeeze liquility in US market? The dollar needs to and is falling due to the huge trade imbalances. The act of cutting interest rates would increase liquidity as the prospects of lower interest rates and future growth would increase investment into capital projects. As long as Japan keeps interest rates near zero, then the yen carry trade will exist because investors have no reason to keep cash in japanese bonds paying virtually nothing when they can invest abroad into higher paying bonds or other investments. The Fed has cut rates before, all the way to 1%, which sparked a liquidity led boom, regardless of the impact on the yen carry trade, which implies that the impact of the liquidity provided by the yen carry trade is not as much as that generated by sharp cuts in US interest rates. The problem the USA has is basically if it cuts interest rates, it will cause a serious inflationary effect in the middle of the next business cycle. Greenspan would have cut rates ages ago to stop the Sub Prime/Credit Crunch from occuring. The question is whether Bernanke is stupid enough to follow and cut rates. I dont think he is but his weaker character makes me think the banks and Treasury will force him to do so. That means get out of jail and some serious inflation in years to come. I say let see some more blood first, lets have some more deflation, decrease in liquidity. The cut rates in a year's time. The more blood we see now, the less inflation in the future. There are always winners and losers, there has to be for Markets to operate. The bank and financial institutions will have you believe they can use derivatives and mathmatics to get out of risk. I say rubbish, it just increases it albeit,delays it. It is obvious Japan has been worn down by their lost decade of defaltion. Their business are not at all dynamic like the chinese. They need to get their energy back and the money their government lends should be put to better use by their domestic corporation/citizens. If they dont they can say good bye to their rank as the second biggest economy in the world. 11 Aug 07, 19:47 FED cut? The central bankers have decided to let [the system] blow up, "As of now, the word is, 'let it blow!' If nothing changes in the meanwhile, it will probably happen. It will be horrible." Consistent with this forecast, the Federal Reserve announced from its meeting today, that it was making no change in monetary policy or "outlook." they looked at the figures, and saw there was no way this could be bailed out. It simply could not be done. For a week or more, they counted all their fingers and toes. It's not that they were negligent; they saw that given the scale of the problem and of their resources, it would be worse if they tried to bail it out, than if they did nothing. They said to themselves, "If we throw our inadequate resources at this, it'll be a disaster!" Better save their limited resources for urgent future use. They had to say, "Let it go!" The central bankers are saying: "Let it happen, and the wilder investors will just have to take their losses," the source said. There will be a lot of damage, and many casualties, but, as far as Bear Stearns and their ilk are concerned, so what if they lose 25% or much more of their assets? Everything was far too inflated anyway. However, there is a real risk that the whole thing could "go over the top," the source said. There are real systemic risks, especially where the private equity control of the real economy is concerned, pension funds being threatened, and so on. But the view of many is that the system HAS to "get rid of all this stuff" before anything can function sanely again.he debt markets are being hit hard." While the Economist fantasizes that bigger investors can survive, it does warn that the "biggest risk to the global economy probably lies with debt-laden American consumers." And, if the squeeze sets off a broader market meltdown, there will be trouble. "The real worry comes from a well-known source--the banks. They will face trouble on several fronts, and it is they who could turn a healthy credit squeeze into a nasty crunch." But essentially, the Economist endorses such a credit crunch, as does today's Financial Times. By tying up money in Hedge Funds in order to guarantee return we are in fact not only deluding ourselves but ruining the economy. Better a soluable risky market than a risk free unsoluable market. The Fed cut interest rates today and stocks surged ! Looks like you may be right and therefore this is a very good time to buy stocks. COnsidering the good number from the US manufacturing data, it becomes even more likely that the US will reduce the interest rates.